I have been a regular at Sushiyama for the past three years, ever since discovering it during one of my earliest excursions on checking out Vancouver's sushi restaurants. For most people, the food they serve satisfies in terms of both quality and quantity. As such, there is often a line-up at the door on most nights (including weekdays), and occasionally during lunch as well. Some of my friends have reported having to wait for a table even at 9:00 p.m., though usually, waits only occur between 6:15 p.m. and 8:30 p.m. for dinner. Today, it was such a hot day in Vancouver (32 degrees!) that my parents and I decided that there was no other choice but to eat Japanese food. The sushi bar is located right inside the front entrance, with regular seating to the right and to the left. The atmosphere is usually quite lively due to the large number of customers and servers. The food also comes out quickly, and without much of a wait, our first dish came. The Caterpillar Roll was excellent in terms of taste and comes with cucumber, avocado, mayonnaise, crab meat, unagi, and BBQ sauce. 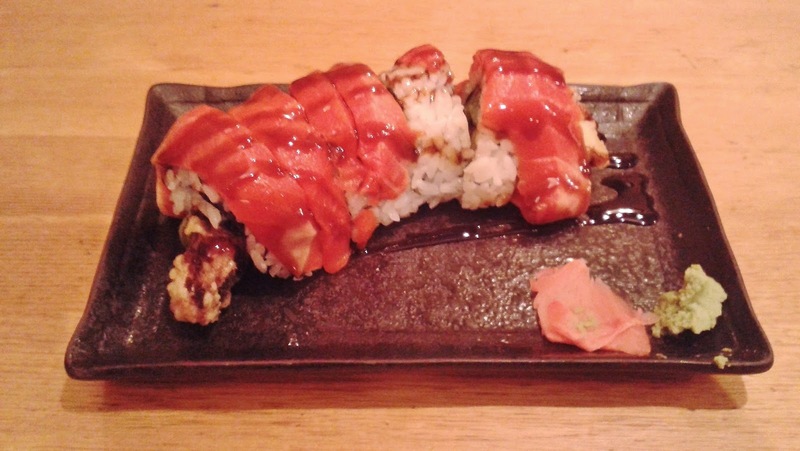 The savoury BBQ sauce was applied in just the right amount to bring out the flavours of the unagi and the crab meat inside the roll. The crab and unagi were very well balanced, and neither dominated the other. The roll was also remarkably soft, making it easy to chew and taste the different flavours. The Toro Nigiri was mostly soft and melty and came on a bed of soft sushi rice. There was some slight toughness in the toro. The Salmon Toro Nigiri was smooth and marbly, but mostly tough. A small portion of the Salmon Toro Nigiri was not tough and had a nice, sweetish, slightly avocado-like taste compared to regular salmon nigiri. 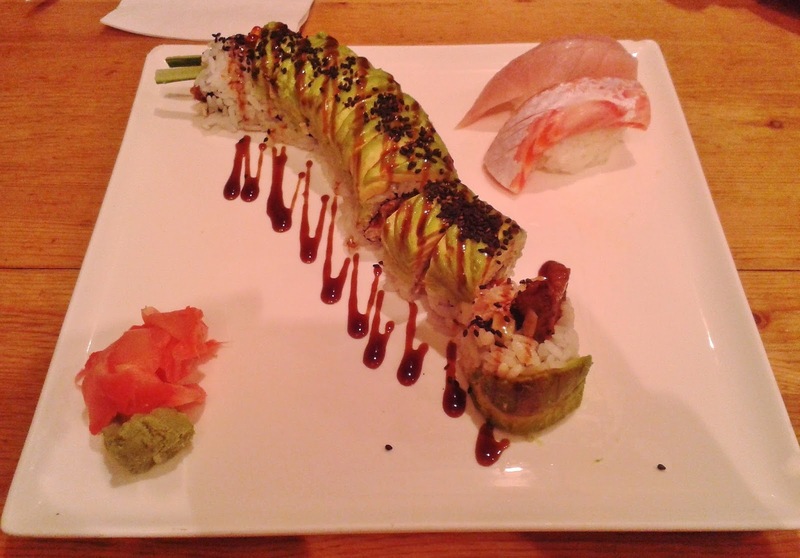 The Red Dragon Roll consists of unagi tempura, avocado and salmon. This roll is usually served with cream cheese and I have tried this roll both with cream cheese and without - I personally like it served without cream cheese better. Now, for this roll, if you're lucky to get the piece with the unagi tempura sticking out, take a bite out of just the unagi tempura. The unagi tastes freshly barbecued and the light batter adds a hint of crunchiness to it. The salmon gives a smoother texture on top and in about two of the pieces, the salmon was slightly too tough. One thing you will notice right away about the sashimi is that the portions are huge! 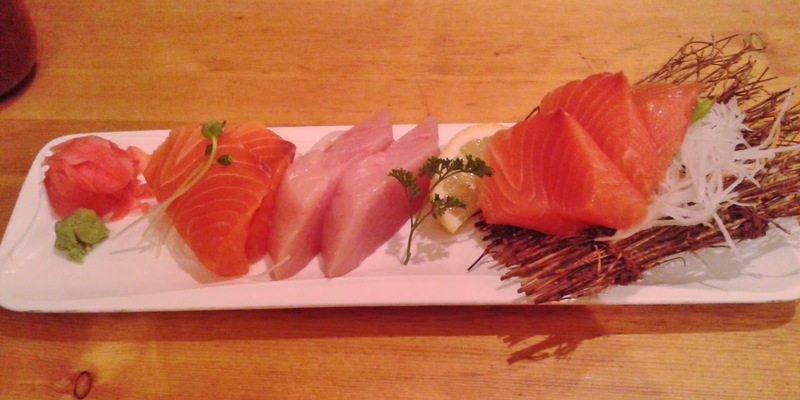 You can easily take one piece of sashimi and split it into two normal-sized ones. This is what drives my friends and family here all the time. The sashimi is quite fresh (this is perhaps due to the large number of customers). The Salmon Sashimi was mostly soft, though was cut a little too close to the edges. The edges were tougher and comparatively more bland, but overall, the salmon was tasty. The Tuna Sashimi was softer, but could benefit from tasting a little less salty. My parents are a big fan of cooked food, so we ordered two cooked items - the Katsu Don and the Beef Udon. Despite its modest appearance, the Katsu Don is not only a good value at $6.25, but also quite a solid dish (or should I say bowl?). A bowl of miso soup also comes with the Katsu Don. 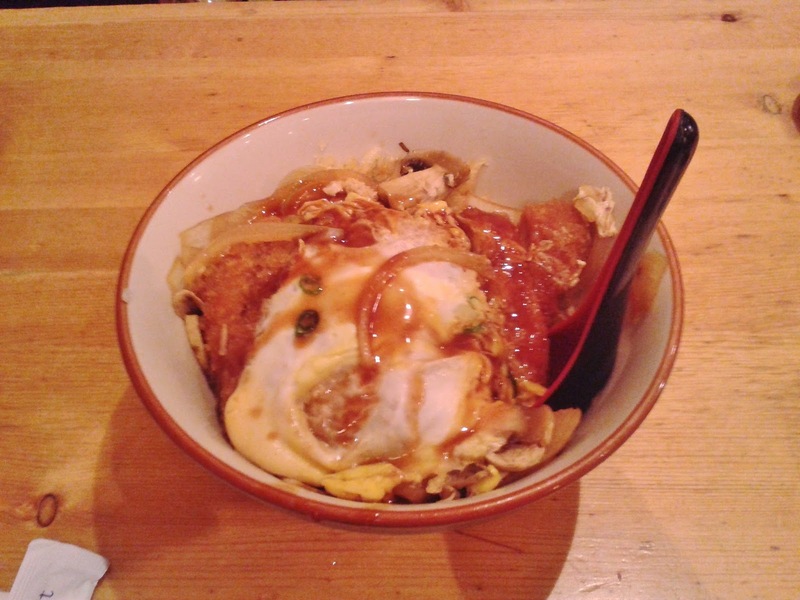 The Katsu Don was served with some egg, onions, mushrooms and tempura bits. The sauce was evenly spread out throughout the rice so that neither the rice nor the egg were bland at all. The egg was also very soft, which made it blend in successfully with the rice. The pork cutlet was a tad too tough, but I really liked the tempura bits, whose crunch contrasted well with the softer rice. 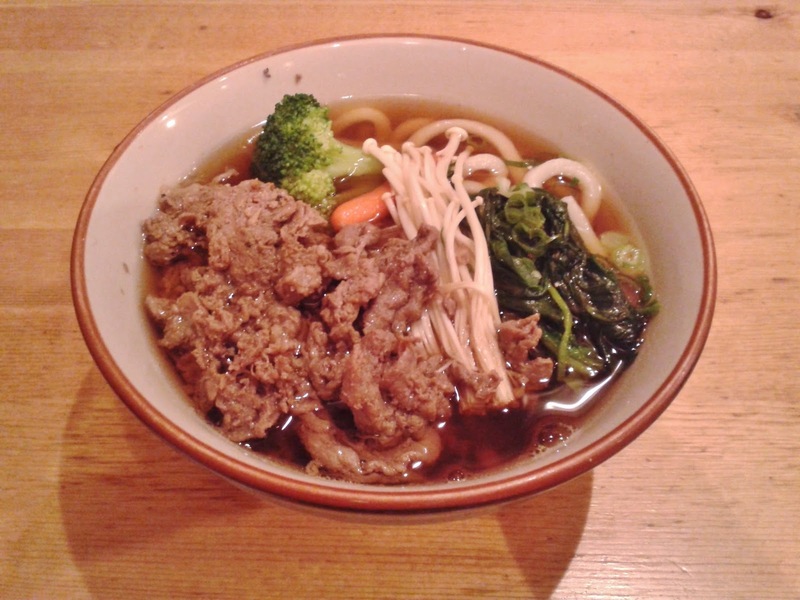 The Beef Udon is served with some spinach, carrot, broccoli and enoki mushrooms in addition to the beef and the udon. The udon noodles have just the right amount of chewiness and the beef had a mostly soft and flaky texture. The soup, which had the savouriness of the beef blended into it, tasted plain awesome. If you are looking for the best bang for your buck, I could recommend no place better than Sushiyama. I once brought in a party of 9 and treated them all for dinner because it was my birthday. I told them all to eat as much as they can, and the bill stayed south of $150. Not only is this a savings of 25% compared to an all-you-can-eat place, but the food is much more than 25% better than even a good all-you-can-eat Japanese restaurant.